Scientifically referred to as Python sebae, The African rock python is one of the popular Uganda Safari reptile species standing as a large non-venomous snake thriving in the south of Sahara on the continent of Africa. The African Rock Python is among the eleven (11) existing species of the Python Genus and has two subspecies. 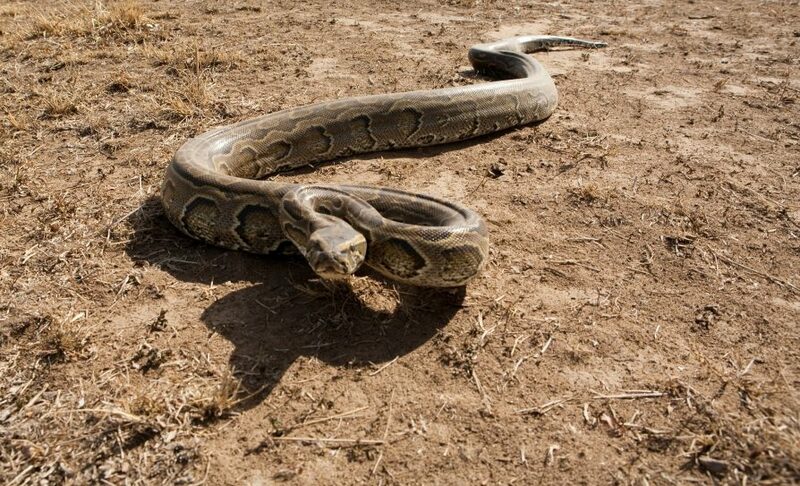 It is noted to be among the world’s six (6) largest species of snakes including reticulated python, green anaconda, India Python, Burmese Python and amethystine python and its considerable size can be explored while on wildlife safari in Uganda. The mature python stretches between 3 – 3.53m but on rare occasions can exceed 4.8m. They stretch between 44 to 55kg in weight but exceptions among adults of over 90kgs have been recorded. The body of the African rock python is notably thick with colored blotches and the body markings can be olive, brown, yellow and chestnut but alter to white on the underside. It has a triangular head with many sharp backward curved teeth. The African rock python features small and smooth scales with those around the lips possessing heat sensitive pits that are utilised to secure warm blooded prey even in the darkness. Unlike other advanced snakes that have one lung, the Pythons possess two (2) functioning lungs. Regarding feeding, the African Rock Python uses constriction to kill its prey. It coils around it and tightens its coils every moment the prey attempts to breathe out and eventually the captive dies of cardiac arrest. Its prey include; monkeys, large rodents, antelopes, warthog, monitor lizards, warthog and fruit bats along with crocodiles in the areas that are forested and poultry, rats, goats and dogs in suburban areas. The African Rock Python is an oviparous reptile and can lay between 20 – 100 hard shelled long eggs in a cave, termite mound or an old animal burrow. The female coils around them sheltering against the predators until their hatching time which is around Ninety (90) days. The hatchlings stretch from 45 – 60cm in length as often encountered on Uganda Safaris and tours. The African Rock Python thrives in a range of habitats including; savannah, forest, grassland, rocky and semi-desert areas but it is majorly associated with places with permanent water and as a result, it’s more common in the surroundings of rivers, lakes and swamps. Most of the Uganda’s National Parks feature such habitats and as a result the African rock python is one of the possible wildlife species that can be viewed while on adventure vacation holiday in Uganda Africa. Though faced with threat of habitat loss and killings by humans, the African Rock Python is still listed as species of Least Concern on the red list of the International Union for Conservation of Nature (IUCN).